↑ "Biography of His Majesty King Bhumibol Adulyadej". The Golden Jubilee Network. Kanchanapisek Network. Retrieved 17 October 2015. ↑ Grossman, Nicholas; Faulder, Dominic (2012). King Bhumibol Adulyadej – A Life's Work. Editions Didier Millet. ISBN 9814260568. 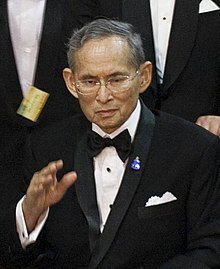 ↑ "King Bhumibol Adulyadej of Thailand – obituary". The Daily Telegraph. 13 October 2016.